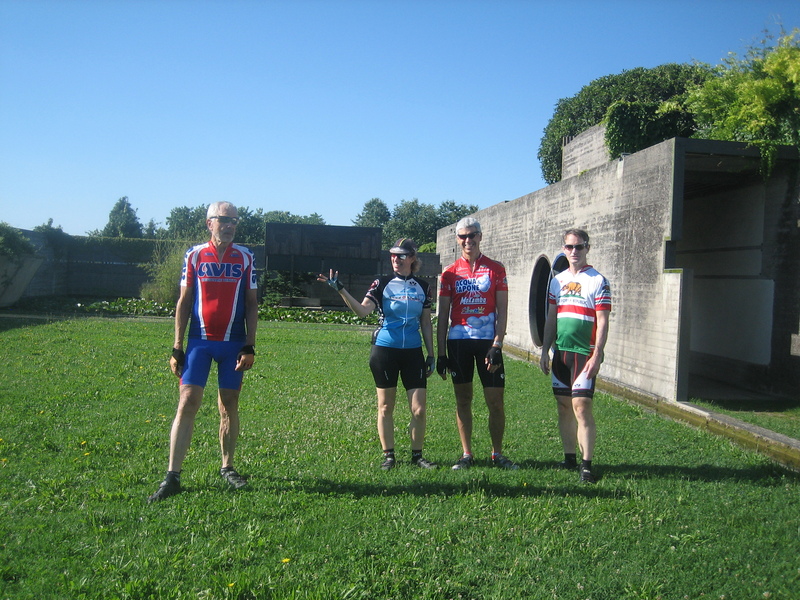 Today George advertised a civilized ride, meaning a moderate pace without killer hills with plenty of cultural stops off the bikes. I had expressed enthusiasm last night at dinner to visit the villa of a Venetian family on the plain designed by Palladio. 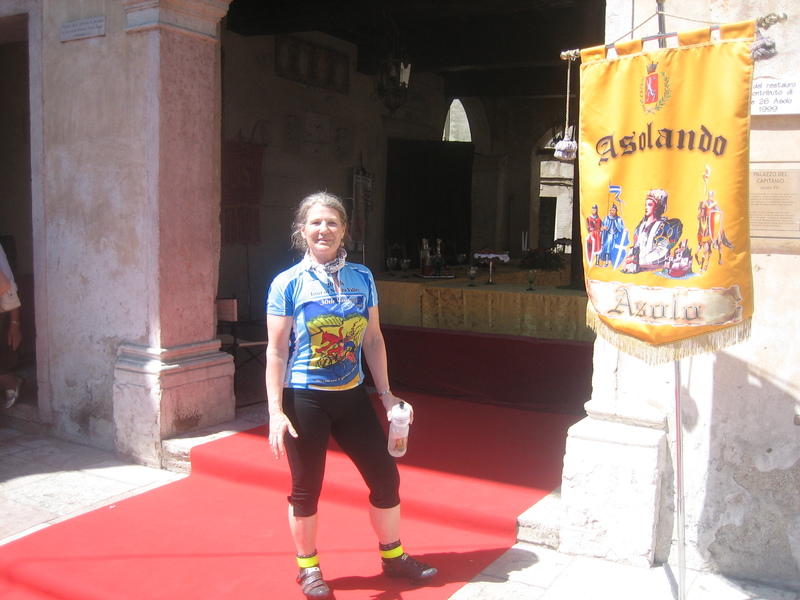 On the return leg we would stop at the ancient hilltop town of Asolo. The ride began going mostly heading south, which is downhill. Through suburb and town, field and pasture, the slope decreases to nearly flat as we went. 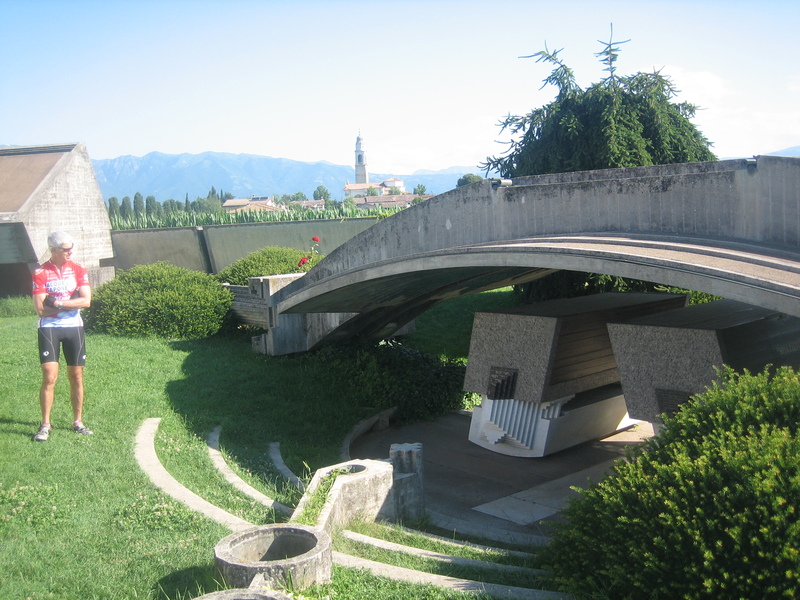 The first stop was to a cemetary, with a modern garden and memorial done in imaginative concrete. It ws an interesting place not far from a village where there were big views to Mt. Grappa and other ridges rising up from the plain. 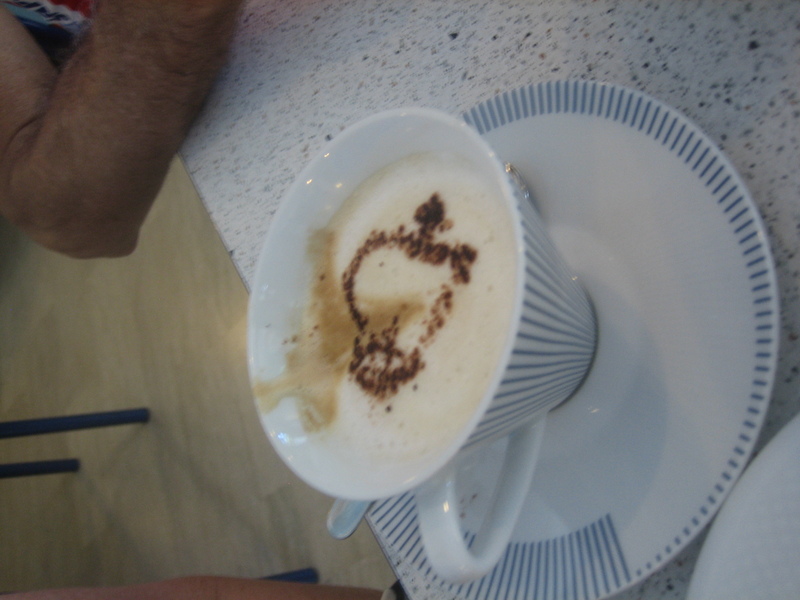 Next we stopped at the obligatory cafe in Altovole. Over the noise of constant churchbells across the street, we ordered coffees and pastries and sodas to refresh our bodies. Just down the road is the villa which was to be our cultural destination. Villa Emo was the country estate of a Venetian family where they grew corn and other crops for the city. In the family were merchants and sea warriors, and they came to the countryside in summer to tend the farm and escape the close heat of Venice. 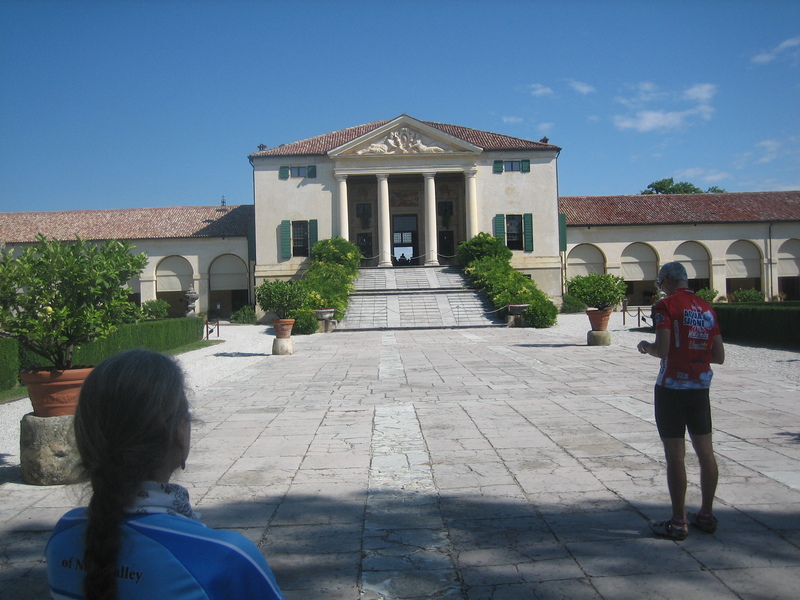 The formal layout by Palladio in the 1550s included the spacious central house, long attached wings used as farm storage barns, and surrounding grounds and lanes. The Venetian family had held the property until only the last few years, and had updated the wings to modern living spaces. The central main rooms of the villa are very well preserved, with classically painted frescos, beautiful floors, and airy ceilings and windows. Beautiful comfortable spaces indeed in which to live, enjoying the views and summer breeze. After maybe 15 kilometers of a barely noticable uphill, we arrived at the base of a hill. Atop is the ancient walled city of Asolo. Yesterday we had stayed below the hill in its suburbs, today we would ride up the moderate grade two kilometers to enter within the walls. 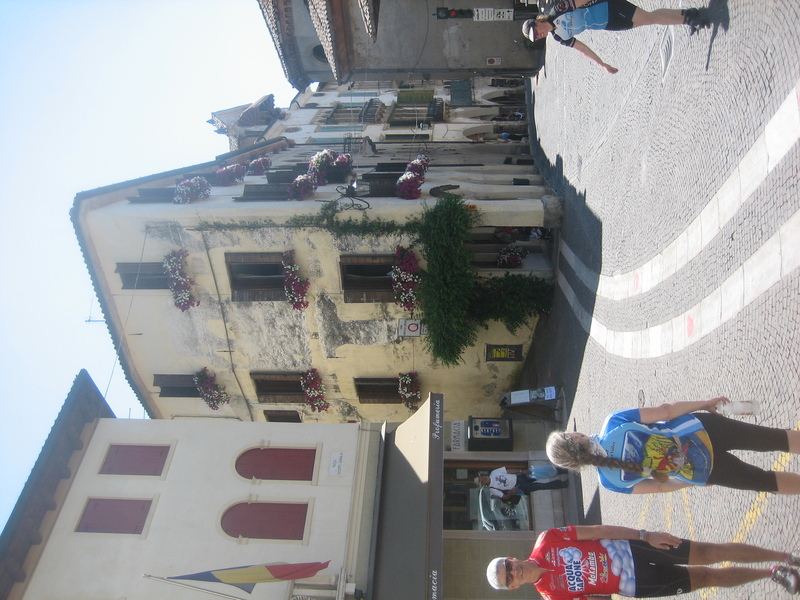 This is a very charming town, with all the feautures one expects off the main piazza. Large church, cafes with outdoor tables, and modern botique shops front the square on the hillside, with its central fountain on the cobbled ground. Stuccoed buildings with a variety of archeticual details are jumbled together around narrow streets and walkways, with the scattered large villas around the hillside. The hill is quite green, many trees providing cooling shade for the visitor. Of course, the flowerboxes, colorful awnings, and shops compliment the stucco and greenery. Looking over all is the walled fortress on the top of the hill. We strolled around and window shopped for a bit, then rode down the hillside and back a similar route to yesterdays’s return to the hotel.